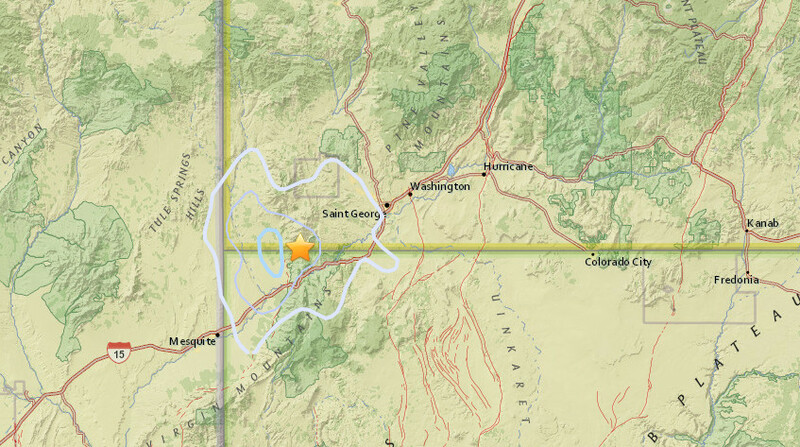 ST. GEORGE — A minor earthquake struck southwest of St. George Thursday morning. A handful of people in St. George, Santa Clara and Washington City reported feeling the 3.0 magnitude quake, according to the U.S. Geological Survey. The University of Utah Seismograph Stations reported the quake just before 3 a.m. about 15 miles southwest of St. George and 15 miles northeast of Littlefield, Arizona. The epicenter of the quake occurred in an uninhabited area near the Beaver Dam Mountains along the Utah-Arizona border. The University of Utah Seismograph Stations measured the earthquake’s shakes as weak-to-light with no potential for damage. Seismic activity and earthquakes are not uncommon in Utah. The USGS reported several smaller earthquakes in the Southern Utah area within the last week. If you are indoors, stay there. Get under a desk or table and hang on to it (drop, cover and hold on) or move into a hallway or against an inside wall. Stay clear of windows, fireplaces and heavy furniture or appliances. Get out of the kitchen, which is a dangerous place (things can fall on you). Don’t run downstairs or rush outside while the building is shaking or while there is danger of falling and hurting yourself or being hit by falling glass or debris. If you are outside get into the open, away from buildings, power lines, chimneys and anything else that might fall on you. If you are driving, stop carefully. Move your car as far out of traffic as possible. Do not stop on or under a bridge or overpass or under trees, light posts, power lines or signs. Stay inside your car until the shaking stops. When you resume driving, watch for breaks in the pavement, fallen rocks and bumps in the road at bridge approaches. If you are in a mountainous area, watch out for falling rock, landslides, trees and other debris that could be loosened by quakes. Good safety tips, thank you! !